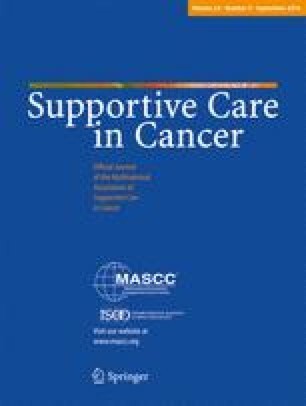 The goal of this study was to examine the symptom burden (SB) and quality of life (QOL) in patients with metastatic breast cancer. Breast cancer patients with metastases were asked to complete the Edmonton Symptom Assessment System (ESAS) and FACT-B questionnaires. Statistical analysis was performed to identify (1) any differences in SB and QOL between patients with bone metastases only and patients with visceral +/− bone metastases and (2) any associations between SB and/or QOL and various clinical factors, including treatment with bisphosphonates, participation in a clinical trial and presence of brain metastases. A total of 174 patients were enrolled. Treatment with bisphosphonates was significantly associated with lower ESAS well-being scores (less symptoms) in patients with bone metastases only. In this same group, receiving treatment prior to diagnosis of metastases was significantly associated with increased fatigue, anxiety and dyspnoea. The presence of brain metastases was associated with higher physical well-being scores (increased QOL). Participation in clinical trials was associated with better QOL. Breast cancer patients with metastases have different SB and QOL in relation to the type of the metastases, treatment interventions and participation in clinical trials. We thank the generous support of Bratty Family Fund, Michael and Karyn Goldstein Cancer Research Fund, Joey and Mary Furfari Cancer Research Fund, Pulenzas Cancer Research Fund, Joseph and Silvana Melara Cancer Research Fund and Ofelia Cancer Research Fund.